"Keep Portland Weird!" is the unofficial motto of the American hipster stronghold of Portland in the US state of Oregon, and this modding audio product is as unusual as it is innovative hailing from this alternative city packed full with creative people and ideas. But, you might say, modding and audio technology in a single product? In the rarefied realm of premium audio hardware this has been somewhat of a rarity - with one ingenious exception: the AntLion Audio ModMic microphone, attachable to headsets and headphones alike and whose Version 5 unifies and builds upon all the strengths of its predecessors. Perfectly designed for multiplayer games, VoIP calls, streaming, podcasts and much more. So you've just discovered your dream headphones, but a microphone is missing, or you already have your ideal gaming headset and the integrated microphone no longer performs (or sounds) as it should, what to do? In this instance switching over to a completely different brand of cans is easier said than done. No one wants to forfeit the perfect fit, that heavy bass, or the ingenious surround sound just because of the microphone. Prompted by gamers themselves as well as audiophiles everywhere, AntLion Audio has ventured forth with a solution. The brand new V5 implementation of the boom microphone offers an integrated dual-microphone capsule with the ability to switch between uni- or omnidirectional sound modes and a 3,5 mm jack. The omnidirectional studio mode offers high sensitivity as well as a broad frequency range, thereby prioritising quality above all else, while the unidirectional mode enables improved noise-cancelling for use in louder surroundings. The retrofitted AntLion ModMic V5 is a technically advanced and premium addition to your favourite set of headphones or - equally - a premium supplement to an incomplete headset. Best of all, it is easily attached to the outer shell of your headphones by simply cleaning the intended area with the bundled alcohol wipe, then removing the protective layer from the rear of the base - it closely resembles a button - and then pressing it firmly onto the intended location. The bond will be sufficiently firm after waiting roughly an hour. Now simply attach the magnetic microphone boom to the base clasp, adjust the swing arm to the right length, and connect the jack at the end of the cable with your PC. The ModMic can be folded 90 degrees up or down, and the boom itself is not only flexible, but also exceptionally adept at maintaining the form you settled on while adjusting it for the perfect fit. The process of removing the microphone is equally as simple due to its magnetism, simply keep the microphone itself on your metal PC case using the magnet or stow it safely away in the bundled carry case. The total length of the provided microphone on the outer shell of your headphones is roughly 17,5 mm. The double-sided sticky pad on the base clasp is made by 3M and ensures that the ModMic V5 attaches perfectly to surfaces ranging from metal and plastic to even mesh surfaces. To allow the user to install the ModMic V5 on a second pair of headphones or re-attach it at a later point, AntLion Audio has provided a second base clasp and an additional 3M sticky pad in the bundle. A mute button for deactivating the microphone quickly is also contained within the bundle and can be used "inline" by integrating it between either the 2 m or 1 m cables provided. More links for "Audio ModMic V5 Microphone - Unidirectional + Omni-Directional (GDL-0500)"
"Well, I think it’s amazing. You have something small, reasonably cheap, practical and, most importantly, it sounds decent for the price you are paying." "The ModMic V5 offers unmatched flexibility with its modular cables and controllers, multiple mounting systems and virtually universal support. If you want to give your headphones the microphone upgrade they deserve, the ModMic 5 is the way to go!" "It is a pretty awesome addition to your gaming experience, and if you already have an audiophile grade headphones then this is an interesting proposition for you"
"If you want to use your high-quality headphones while gaming, the ModMic 5 lets you do that in style. Sound quality is great, while there a lot of options made available to the end-user. The only issue is the extra cable – for which there is no perfect solution." 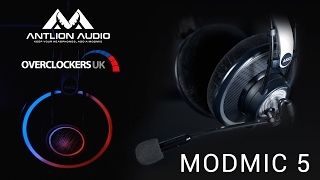 "The Antlion Audio ModMic 5 is now better than ever and it was already very good. If you are looking to add a microphone to a pair of headphones the ModMic 5 is the best solution."